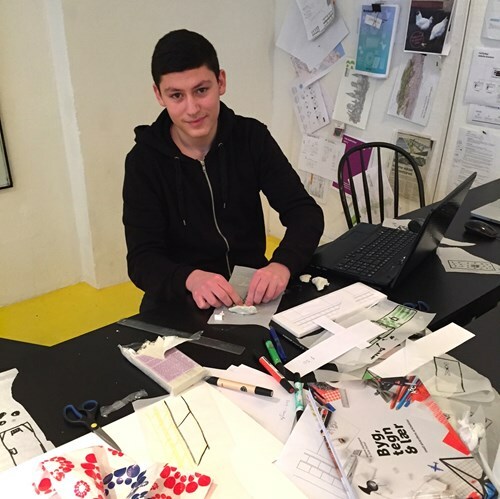 Last week our office hosted a short internship for Amir – our youngest intern so far. Amir is an 8th grader from Blågård School in Nørrebro. After participating in the Schoolyard project we organized at his school previous fall, Amir contacted us about his latest school assignment, in which the students have to go outside the school context and explore different occupations. Amir is very curious about architecture as a profession and we were happy to provide him an opportunity to join our office for a week. During the mini internship in our office, Amir got a task to work on a plan for a Parking Day event, in which a local parking lot is temporarily transformed into a space for community gathering. In order to gain new skills, we provided him with digital tools, such as our CoCityApp that helped him do a site analysis, and design softwares that he used to create 3D models. As a result of this process, Amir produced several models that express his ideas. He thinks that its very important for the neighbors to have more opportunities to meet each other. Therefore, he proposed to bring the local cafés to the parking lot to make it more inviting. Also he suggested more activities for kids, so he created models of temporary football and dancing playgrounds. We appreciated Amir’s ideas because they show how the youth can also contribute to discussion about urban resilience and improving livelihoods of small urban spaces. He will present his experience at arki_lab for his classmates back at Blågård Skole (see segments of his presentation bellow). Leder du efter en praktik i foråret 2019? Hvordan løfter vi byens beton? Load MoreFollow arki_lab on Instagram!